Leslie Rogers was a quiet man. He was short. As I remember, he was shorter than some of us teenage boys. And, we still looked up to him. He lived with his wife, daughter Gail and son Roland at the Wild West Farm (135 East River Road where Nate and Stephanie Smith now live) they had dairy cows, Ayrshires, as I remember, the only heard of that breed in the area. They also had "layers" in a chicken barn just south of the farmhouse. My mother, Lydia Chase, as the area correspondent for the Kennebec Journal, wrote an illustrated front page piece when it appeared that the chicken house - indeed possibly the Rogers cozy home was in danger of sliding into the Sheepscot - when a landslide behind the henhouse cascaded tons of earth toward the river. That side of the road bordered on what was known as the "Oxbow", an acute elbow bend in the river (bottomless, of course), where the resulting accelerated river current continued eating into the south bank - the bank behind the chicken house. Mr Rogers also, at that time, raised "broilers" in the huge 3 story barn on the sharp corner (211 E. River Rd) that is now the home of the Fosters. For in the 1970's, the well known writer John Cole had purchased and transformed the barn into a remarkable multi-storied barn/residence where Bob and Carol Lenna lived for several years in the 1980s. They had many memorable community New Years Day Bloody Mary parties in that remarkable barn. My grandmother Eola Condon Atwood while driving her 1940's Hydromatic Fluid Drive Oldsmobile ( "a substantial automobile" she would say) with her husband, my grandfather John, who never learned to drive, went off the road on this 90 degree corner while coming from Bath to visit one Thanksgiving in the early 1960's. Please stick with me as I bounce around on this journey. Some things aren't remembered nor best delivered in sequence. Mr. Rogers had volunteered to lead a 4H club for us boys. He walked like he had a brace on his back - ram rod straight. And, he was quiet. We listened carefully when he spoke. I guess, back in the 1950's we were typical rural teenage boys. But, in hindsight we appear pretty numb, callous and the sort that would not attract the attention of a responsible citizen looking for an opportunity to "have fun with kids". Indeed, Mr. Rogers must have seen us as a dire challenge. A 'work in progress" as they say today. Our meetings were held in the North Whitefield Firehouse across the road from Thurlow Crummett's General Store. Thurlow Crummett was a wonderful person ! He loved the children of Whitefield as he did his own three. He placed a television in the window of his general store so that we kids could enjoy the fantastic black and white geometric test pattern that channel 13 had on display from noon to 5 each week day. This was our village, our "downtown", the place where it happened. We could see our future from here. When he got cancer and tried unsuccessfully to end his life, it was one of the lowest points our community had known. I cried. To this day, those who remember Thurlow Crummett, do it with a quiet moment of honor and respect. As youth, we had witnessed an important and terrible lesson about the failings of science and religion. It was in the firehouse at the 4H meetings that we were introduced to "Roberts Rules of Order" and were expected to follow them. There was a picture of my father, Norman Chase on the wall over the table where we "deliberated". I had the feeling he was helping Mr. Rogers by keeping his eye on my brother Steve and me. Actually, it hung there because he had started the Fire department along with Paul Burns sometime in the late 40's. My mother still remembers the thrill when they arrived in the dooryard with their first used fire truck from the city. I don't recall all the members of that great club, but it did included our neighbor Norman Cloutier, Leo Gould and Roland Rogers along with Steve and me among others. 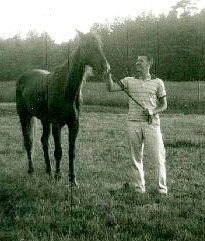 Here is an image of Norm Cloutier with Steve's spirited palomino "jerry" in 1959. Mr Rogers had one of those beige caps that were worn by just about every rural Maine man in the 1950's. Indeed, He "matched" as the women would say. He had beige shirt and beige trousers. The trousers were belted high, nearly chest high. He always wore white socks. Steve would say he was "all business". It seemed that the younger and corkier the man, the more "cocked" he wore his cap. Indeed, Harold Doucette who was a wood cutter for my uncle Chet, wore his cap so cocked that you expected it to slide off the side of his head at any moment. That, and a cigarette in the very corner of the mouth with a 1" long ash, was about all it took to say "Stand aside kid, you are looking at THE man !". Mr. Rogers wore his cap flat and square atop his head. When he took off his hat, as he always did in greeting women and entering ANY building, it revealed a carefully combed, flattened and parted hair. Mr. Rogers was the model of respect. This is not to imply that the Rogers family were without proper emotions. On the 4th of July, they were legend for their remarkable annual fete of patriotism, when they would place black powder in an old 10 gallon milk can with a piece of fuse protruding from the bottom. The cover was pushed on, and the whole "cannon" was placed in a wooden frame tilted toward the "broiler barn" up on the corner. The fuse was lit and with a thunderous roar the cover was blasted in a graceful skyward arc toward the western horizon. It should be noted here that I never met anyone, outside the Rogers family, who ever witnessed this event - the Rogers were a private family. But every year there were reports of all distance records being shattered. Everything was getting bigger, better and more exciting in these halcyon days of our youth. Steve, my older brother, was the first from our club to receive a heifer from the "Heifer Project". It was a Big Deal, not quite as big as the Westinghouse Electric award that "Brother" Percy Cunningham had won, where we all rode in a ceremonial automotive caravan to Union to witness his presentation ceremony. But, it was BIG ! Steve received a registered (can you say REGISTERED as in PUREBRED) heifer calf....... with papers. Papers that registered not only the names of the parents of this noble beast, but registered the actual markings ........ exactly where it was white and where it was brown. It was a Certified Purebred Guernsey heifer. These were the days before the popularity of the heavy producers of "watery milk".. the huge black and white Holsteins. This heifer was what, in later years, "modern" farmers would refer to as a "colored cow". Before these days, artificial breeding was not known to us in the country, and if it had been, we would not have been permitted to utter the words. These were the puritanical days when no one would even say the word "pregnant" out loud. So, to have a calf that had "registered" parents was like.....like royalty ! As I remember it, Sears Roebuck sponsored the project in cooperation with the Heifer Project. Purebred heifer calves were awarded to deserving 4H members to raise, train, show, breed (now via registered stock using artificial breeding) and thus improve the general milking herd. The 1st born heifer from this calf was to be returned to the project, to be given to another 4H member to continue the cycle. This whole wonderful crafted cyclical process was made clear to us by Mr. Rogers. He carefully laid out before us the "grand plan" whereby thru the Heifer Project the quality of our herds, their milk production and the general welfare of dairy farms all over Maine would be improved. AND, by paying back a new heifer the process could continue- ad infinitum - as it were. This was a very radical concept, especially for that cold war, McCarthy, fear of anything new or different, right wing reactionary era ! Were on the leading edge. It was revealed to us that change was something that could be nudged and moved to our collective advantage with our work and vision. Mr. Leslie Rogers might have been run out of town as a radical social engineer ! But, he wasn't - and the times changed. Indeed, townspeople began to feel so good about the involvement of their youth in matters of the future that the likes of historian Henry Waters, teacher John McCormick, merchant Thurlow Crummett, pastor Father McFarland, civic leader Charlie Miller and the Arlington Grange along with other movers and shakers (I love that term) decided we needed our own 4H fair, right here in Whitefield! And so, for at least two years, we had our own 4H fair! It was held at the Arlington Grange Hall (formerly the Erskine Post of the Civil War Veterans of the Grand Army of the Republic). There were exhibit tables inside where garden produce was displayed on bright white roll paper and the appropriate colorful ribbons awarded. Outside, we would parade our heifers before the judges around carefully placed 10 gallon milk cans. There were cages of hens and roosters, there were sheep and I swear someone brought a donkey once, - we all thought that Mr. Rogers was a person who could make things quietly happen. We began to understand "engineering" . We also showed our calves at Union and Windsor fairs. The ritual preparation of washing and clipping those heifers so that they would appear "new" was an ordeal suffered to escape the awful notion that someone would think we kept a dirty dairy. After the appropriate waiting period, I too, was to be awarded a Heifer Project calf. It was a memorable event. I remember most the charge of responsibility that had been given me. I remember the certificate and reading the fine print, I remember worrying about what would happen if my heifer only calved bulls ! Thank you, Mr. Rogers !